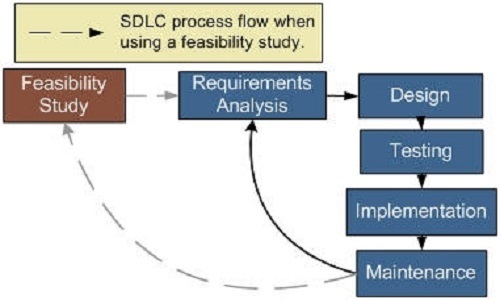 Feasibility studies aim to objectively and rationally uncover the strengths and weaknesses of the existing business or proposed venture, opportunities and threats as presented by the environment, the resources required to carry through, and ultimately the prospects for success. Economic analysis is the most frequently used method for evaluating the effectiveness of a new system. At this level, the concern is whether the proposal is both technically and legally feasible (assuming moderate cost). We Determines whether the proposed system conflicts with legal requirements, e.g. a data processing system must comply with the local Data Protection Acts. This is an analysis of the costs to be incurred in the system and the benefits derivable out of the system. This is an analysis of the time required to achieve a return on investments. The future value of a project is also a factor. Total estimated cost of the project. Projected cash flow and profitability. Existing investment by the promoter in any other business. Financing of the project in terms of its capital structure, debt equity ratio and promoter's share of total cost. We are confident that Datasoft is very well equipped to handle all your data conversion jobs.